New book, 48 pages, NVG174. The Nimitz class aircraft carrier is the ultimate symbol of the United States superpower status. A true behemoth, this is an unsurpassed weapons platform that overshadows all of its nearest rivals. 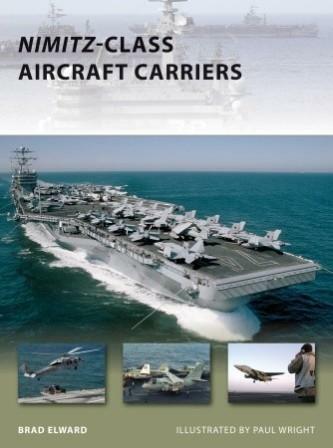 A history of the largest aircraft carriers in the world, with runways over 300 meters long, this book looks at the development and deployment of the nuclear-powered Nimitz class aircraft carriers from 1975 when the USS Nimitz, the lead ship of the class, was commissioned, to the present day. All of the class are still operational and the tenth and last of the class, the USS George H. W. Bush, was commissioned in 2009. Here, Brad Elward provides a detailed overview of their design and development, highlighting their unique features, from jet blast deflectors to cutting edge radar systems, and a history of the Nimitz class in service, from deployment in the Gulf during Operation Desert Storm, through to the enforcement of the no fly zone over Bosnia.